The American Indian Higher Education Consortium (AIHEC) serves as the core network and national voice of the nation’s 37 tribal colleges and universities. It provides those tribally- and federally-chartered institutions with services in the areas of advocacy, public policy, research and program initiatives. Now it’s helping First Nations Development Institute (First Nations) spread the word about Native food sovereignty to students and others at those tribal campuses and in the college communities. At the AIHEC Annual Student Congress in March 2014 in Billings, Montana, the students will hold a food-assessment competition. Formally assessing a community’s food assets, systems and processes is a key first step in developing a strong food sovereignty outcome in that community. The building block of the student food-assessment competition is First Nations’ own Food Sovereignty Assessment Tool, or FSAT, which First Nations developed in 2004. The student congress representatives took First Nation’s assessment tool and made some modifications to fit their needs for the competition. The congress is now distributing the document to each tribal college or university so they, in turn, can interest their students in competing in the event. Students must turn in their completed assessment by February 1. As many as two students can collaborate on each entry. The most thoroughly completed assessment – with the best attempt to inform and make the most difference in their community in regards to food sovereignty – wins the competition. The winner or winners, who will be decided ahead of the conference, will receive a stipend to attend the conference, where they will present the findings of their assessment. 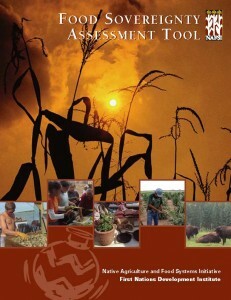 You can find First Nations’ Food Sovereignty Assessment Tool at this link – http://www.firstnations.org/KnowledgeCenter/NativeAmericanFoodsAndHealth/Resources — along with many other resources dealing with Native food and agriculture.